An 11-year-old boy with Duchenne muscular dystrophy (DMD), diagnosed in the first decade of his life, was referred for cardiac evaluation. He was able to ambulate without support. He denied exertional chest discomfort, shortness of breath, palpitations, or syncope. On physical examination, his blood pressure was 100/60 mm Hg, with a heart rate of 82 beats/min. The jugular venous pulse was normal. There were normal cardiac heart sounds with no murmurs. There were no signs of cardiac failure on physical examination. A 12-lead electrocardiogram demonstrated partial right bundle branch block. 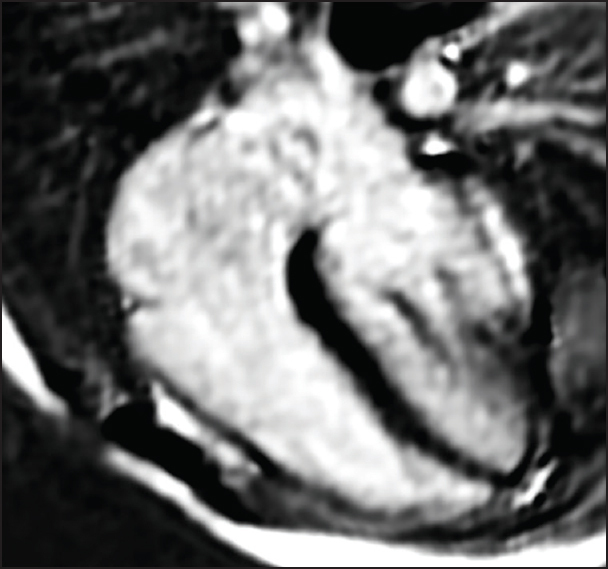 Transthoracic echocardiography demonstrated normal-sized ventricles with normal ventricular function. Cardiac magnetic resonance imaging (CMR), performed on a 1.5 Tesla (T) scanner (Achieva, Philips, Best, The Netherlands) showed normal left ventricular (LV) size and systolic function [LV indexed end-diastolic volume of 69 mL/m 2 and LV ejection fraction (LVEF) of 68%]. On late gadolinium enhancement (LGE) imaging there was subepicardial enhancement of the mid- and basal-posterolateral segments of the LV free wall with the involvement of less than one-third of the LV free wall length and no septal involvement [Figure 1] and [Figure 2]. Based on the above findings on CMR he was initiated on therapy with angiotensin-converting enzyme (ACE) inhibitors. With improved magnetic resonance imaging (MRI) technology and protocols, and better understanding of the disease progression, CMR is increasingly being used as the preferred mode for surveillance imaging in children with DMD. The finding of LGE, a marker of myocardial fibrosis, has a unique pattern in patients with DMD as noted in the present case. Hor et al. noted that LGE was more prevalent in the free wall segments compared to the septal segments (42.7% versus 5.3%). 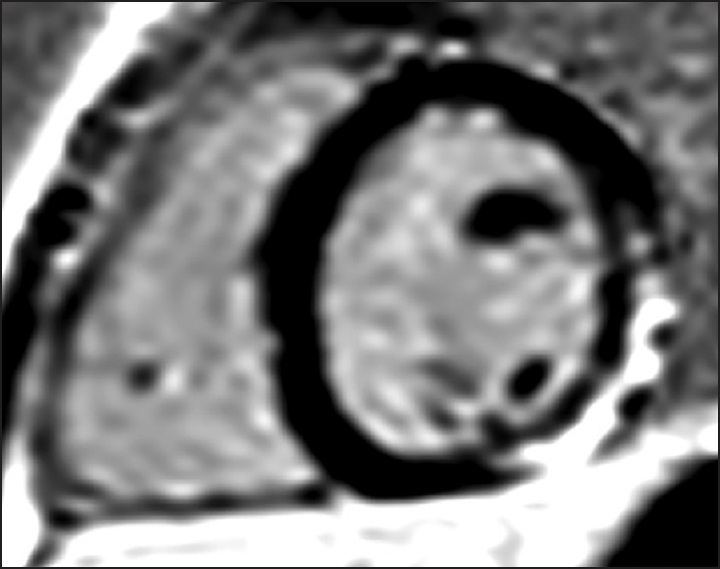 LGE was more prevalent at the base and mid-ventricle, and in the anterolateral, inferolateral, and inferior segments. Florian et al. showed that subepicardial and intramural LGE were the most common form of myocardial involvement in DMD. Furthermore, they noted that transmural pattern of LGE and impaired LV systolic function (LVEF <45%) were independent predictors of adverse cardiac events. It is hypothesized that fibrofatty replacement of the myocardium results in diffuse myocardial fibrosis and is a key step in the development of cardiac dysfunction. Menon et al. note thatLGE on CMR is an independent predictor of adverse cardiac remodelling, ventricular arrhythmias, and death in DMD. Given that CMR is a sensitive tool to detect myocardial fibrosis well before any ventricular dysfunction is evident, this finding has important implications in the management of these patients, including on the time of initiation of medical therapy. Some studies have noted that early institution of ACE inhibition delayed the onset of LV dysfunction and improved mortality. McNally EM, Kaltman JR, Benson DW, Canter CE, Cripe LH, Duan D, et al. ; Working Group of the National Heart, Lung, and Blood Institute; Parent Project Muscular Dystrophy. Contemporary cardiac issues in Duchenne muscular dystrophy. Circulation 2015;131:1590-8. Hor KN, Taylor MD, Al-Khalidi HR, Cripe LH, Raman SV, Jefferies JL, et al. Prevalence and distribution of late gadolinium enhancement in a large population of patients with Duchenne muscular dystrophy: Effect of age and left ventricular systolic function. J Cardiovasc Magn Reson 2013;15:107. Florian A, Ludwig A, Engelen M, Waltenberger J, Rösch S, Sechtem U, et al. Left ventricular systolic function and the pattern of late-gadolinium-enhancement independently and additively predict adverse cardiac events in muscular dystrophy patients. J Cardiovasc Magn Reson 2014;16:81. Puchalski MD, Williams RV, Askovich B, Sower CT, Hor KH, Su JT, et al. Late gadolinium enhancement: Precursor to cardiomyopathy in Duchenne muscular dystrophy? Int J Cardiovasc Imaging 2009;25:57-63. Menon SC, Etheridge SP, Liesemer KN, Williams RV, Bardsley T, Heywood MC, et al. Predictive value of myocardial delayed enhancement in Duchenne muscular dystrophy. Pediatr Cardiol 2014;35:1279-85.